With its integrated design, the Tick doesn’t get in the way of accessing your equipment - so you won’t need to remove it from the case. If you do want to remove it, it’ll detach in seconds. And once your guitar’s out, the Tick becomes your workstation. Unzip the front panel of the Tick and your cables, strings and tools are right there for pre-show tune-ups. 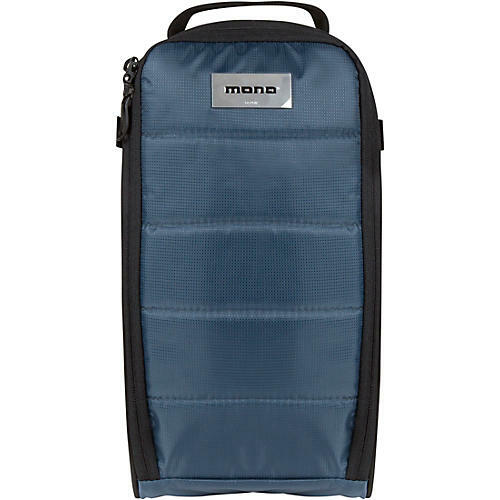 Rock solid, industrial webbing handles come standard on MONO cases. Bar-tack stitching and steel rivets reinforce for strength, while high-grade webbing provides a super comfortable grip. The Tick attaches quickly and securely to any Tick-ready MONO guitar case, and detaches just as easily. It’s as simple as opening the military strength straps at the top and the back of the Tick, and feeding them through your case’s powder-coated steel D-rings. This creates a 3-point connection, for extra secure attachment. All M80 guitar and bass cases are now shipped Tick-ready. MONO builds cases to military specs, using only materials with extreme resistance to abrasion and the elements. Steel-riveted handles, high-density padding and a water-resistant shell ensures a safe journey through harsh conditions. The Tick is sized to fit small pedalboards, including the Nano by Pedaltrain. But you can fit any combination of things - whether it’s pedals, personal items, or your cables and headphones (secured by the cable strap). There’s also a mesh pocket inside for those bits and pieces you want to keep safe and visible. And of course, there’s dedicated space for those all-important tools that can help you avert disaster. These measurements represent the inner capacity of the Tick. If you are unsure about the fit for a particular pedal, amp, etc, it’s best to make sure it doesn’t exceed any of the maximum dimensions shown here.